Most of you will recognize this phenomenon: You visit a place once, and it seems interesting. You try a couple of items. 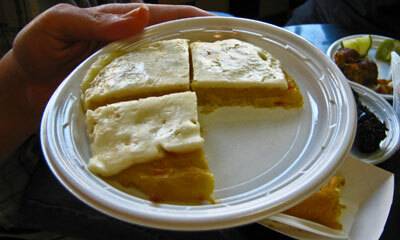 (In this case, flan de queso and guava pastries are the teasers.) The place stays in the back of your mind, and you find yourself there without really planning to take that particular route north. On your second or maybe third visit, the counterperson asks you how you are, and would you like the same thing you ordered last time you were in? Then she recommends that you wait a few minutes for the fresh ones to come out of the oven. The other customers smile, and one of the 30-ish gentlemen politely offers you his seat at the counter. The baker comes out of the busy kitchen beaming and says, "good morning." (N.B. You are not a stunning 20-something in stilettos, but a saftig 50-something in sensible shoes.) This is what happens at Mekato's Colombian Bakery. Little by little, the place starts to get under your skin. Mekato's Colombian Bakery and cafe is a draw for Chicago's Colombian community. The place is pristine and cheerful, with a couple of tables in the window and a long tiled counter where you can sip your coffee or an agua fresca. Watching the bakers work harmoniously in the spotless kitchen behind the counter always makes me wonder whether I missed my calling. A sign over the coffee bar says "Bunuelos Dias," a play on the greeting and the familiar Colombian fried dough, the bunuelo. These spherical, dense breakfast pastries have a slight crunch and the tang of mild cheese to them. With a cafe con leche, these are my favorite Chicago breakfast. Puff pastries and yeast bread rolls with guava filling seem especially popular, and the torta negra doesn't last long in its place of honor on the counter. 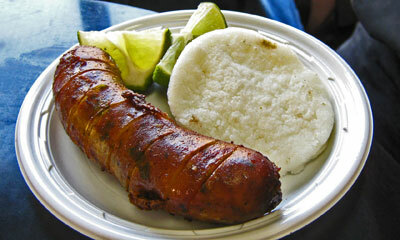 Lunch items are available as well: chicharron, sausages, empanadas, arepas, and tamales in banana leaves. The prices are very low, making this place one of the best values in town. For the price of a latte at an overexposed national chain, you can get fresh pastry or empanadas with cafe con leche at Mekato's. I know this is a long shot for a GNR, but I feel strongly that it meets the criteria. I hope others will visit. Street parking is usually open. Go early if you go on a weekend. Man : I can't understand how a poet like you can eat that stuff. T. S. Eliot: Ah, but you're not a poet. We live a few blocks from Mekato's, and the Bunuelos and chicken empanadas are favorites of ours, especially when we have friends or family in town and want to impress them with something different for a Saturday morning breakfast. It's impressive how something so different from what I grew up eating can so quickly become comfort food, but some things just hit that spot, familiar or no. The bunuelos do resemble the fried biscuits we have every year at my family's big hog roast down in Missouri with their crisp fried exterior and the soft, springy interior, but the slight cheese flavor just edges out this long-time favorite of mine. I haven't been thrilled with everything I've gotten there: there were some baked goods resembling cinnamon buns that were very hard and dry. But it's a business that I'm very glad to have in the neighborhood, so I will add my vote in favor. Hey I have a website. You sure made me want to go. Can't comment on the place, since I have not been, but the nomination is strangely compelling Josephine. I will go and comment. I stopped for breakfast at Mekato's today. The place was friendly and clean as a whistle. They have a pretty large bakery operation in the back, the size of which surprised me a little bit. Behind the counter as you walk in is a window into a rotating carousel of proofing dough of many sorts that you can watch. I got a couple of empanadas (one beef and one chicken) and a café con leche to eat there and two alfajores to go. The entire bill was just a shade over $5 (minus tip). Everything was very good. This place has all the makings of a GNR, but I'd sure like to see it get a little more LTH love during the nomination period. This place, like one or two other nominations this round, would really benefit from a bit more of a track record. 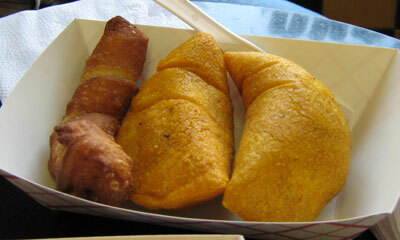 And besides, the empanadas, though a bit heavy on the potatoes, are really good. Is Mekato open Sunday morning? If so, what time does it open. I am thinking that I will go and catch breakfast there this Sunday if anyone wants to meet me there. dicksond wrote: Is Mekato open Sunday morning? If so, what time does it open. I am thinking that I will go and catch breakfast there this Sunday if anyone wants to meet me there. Mekato's is open 7am - 9pm 7-days a week. I'd be pleased to meet you there Sunday, though a wee bit later than ohsodamnearlysevenhundred. Guys, remember that the bunuelos don't come out until around 8:30 AM. Josephine, this place looks wonderful! I was actually going to try and make it today and got sidetracked, but I'll give it another shot tomorrow. I'm really looking forward to it, thanks for the great tip! Ursiform wrote: Josephine, this place looks wonderful! I was actually going to try and make it today and got sidetracked, but I'll give it another shot tomorrow. If you can hold off or, better yet, go twice in a week, I am meeting Dickson at Mekato's Sunday morning at 9:30am. All are welcome to join and Dickson will be putting up a notice on the Events Board. Knowing that I'd be busy Sunday, and since I was near the neighborhood at lunchtime today, I stopped by Mekato for lunch. It's a great place to make up a lunch of small bites - you can have an LTH-style meal here without a cadre of LTH companions. I opted first for the chicarron, calling me crispily from the hot food case. It was served simply, with a wedge of lime and an arepa, but was prepared perfectly - fried to just to crackling, the meat still juicy. I also, after asking a bit, opted for a beef empanada. While the filling was a bit one-note, the softness of the beef and potatoes inside contrasted sharply with the hard-fried masa exterior; I've never had a Colombian empanada with such a satisfying crunch. Following these two rather large bites, I opted for a buñelo, outing myself as a gringo by butchering the pronunciation (I'd been going along swimmingly in Spanish up to that point, its boonyuehlo, not boonwelo) I'm not ordinarily a fan of fried sweets, but these are different - first of all, the exterior is slightly salty. The interior has the spongy texture of angel food cake, but with only a hint of sweetness rather than the sugariness I expected. It was delicious; it would be easy to off a tray of these without realizing you did it. This was all washed down with a fresh Mora (blackberry) drink. To finish, I tried an alfajor (mostly to see if I liked them better than the chocolate lemon-pledge flavored boxed ones everybody forces on you in Argentina) It was a good, crumbly cookie (almond?) with just a hint of dulce de leche, dusted with powdered sugar - a perfect accompaniment to one of the espresso drinks they offer. This entire feast totaled about $8.50 with tip. 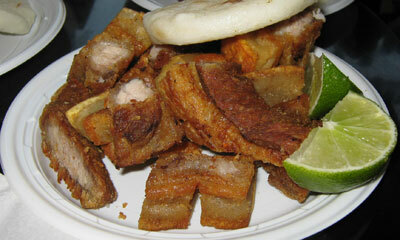 Regrets: the figs stuffed with cajeta and the sausages that were next to the chicharron in the hot-food case. If anybody tries these, please post. Mhays-- I was a bit nervous seeing you had posted, but so glad to see that you enjoyed Mekato's, knowing what a discerning critic you are. Your description of the bunuelo (sorry, I don't know how to do the en-yay on my keyboard) is astute. It is not your everyday fried dough, and so much the better! I should really give Cathy2 the credit for this nomination, since it is she who introduced me to Mekato's, on my very first LTH outing. Though my Mekato's experience consists solely of one 5 minute visit to say hello to some LTHers, buy a buñuelo, and sample a fig with cajeta thanks to Gwiv's generous offer - it's enough for me to give my support. 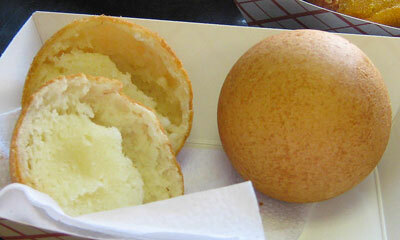 The buñuelo was not too sweet, which I liked a lot, and was devoid of any grease. It was a clean, crisp tasting fried ball of dough stuffed with some darn tasty farmer's type cheese. The fig tasted like it had marinated a bit in something that imparted a nice, tart effect, offset perfectly by the sweet caramel. I'll definitely be back. Didn't get moving in time to catch the LTHers at Mekato's this morning, but we rolled in anyway around 11:30 for an early lunch. Mekato's was friendly, interesting, and delicious. They are very good at what they do. I was very impressed, and support this nomination. Empanadas - Tried chicken and beef. Both were wonderful, but I give a slight edge to the beef. Crispy crust, well-seasoned, shredded-meat and potato interior. Yum. Carimañola - These were meat pies that were filled with a similar (if not the same) filling as the beef empanada, but surrounded by mashed cassava, and then fried. They were just ok. The meat was tasty, but there was too much gluey cassava for my taste. Meaty Potato Ball - Failed to get a proper name for this one, but it was quite tasty. It was like empanada filling, with a higher ratio of potato to meat, rolled into a ball slightly smaller than a baseball and fried without any coating. It wasn't quite as good as the empanadas, but it was good, and since I was dipping it in the Aji, I fought for the last bite. 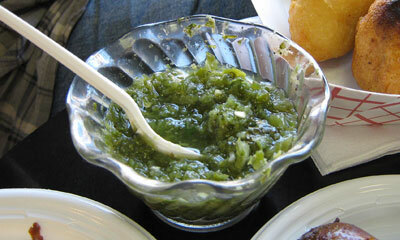 Aji - This condiment for the empanadas put me over the top. Loved it. 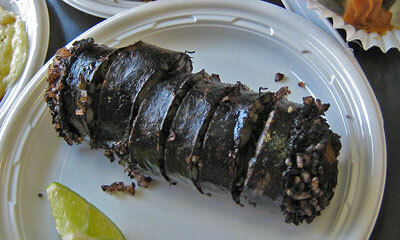 Tasted like it was made of cilantro, some type of chilies, green onions, vinegar, lemon juice, salt and black pepper. Simple, but delicious. Cheese Stick - Light puff pastry tube, filled with melted cheese. 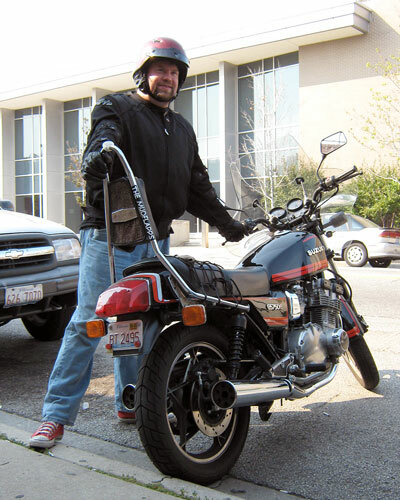 This was special only for its lightness. Buñuelos - These have been written about extensively. Slightly-cheesy, slightly-sweet doughnut. What's not to like? Guava Puff Pastry - This was very good. Sugary, cinnamon-flavored puff pastry with guava filling. Josephine wrote: I should really give Cathy2 the credit for this nomination, since it is she who introduced me to Mekato's, on my very first LTH outing. You offer me far too much credit, because it was my first time in Mekato, too. I believe we were attracted to stop there because of the Bulgarian deli next door, then we wondered into Mekato to see what we could see. While I have gone there occasionally, Josephine has really been much more of a regular than I.
I am happy to endorse Josephine's nomination as a tribute to good taste and the joys of serendipity. I concur with RAB's assessment of our visit, and agree that Mekato is worthy of GNR status. Living in Chicago, we are fortunate to be able to sample cuisine from so many different countries. At the same time, though, I sometimes feel that there isn't much that's new to me. Thus, I'm thrilled when I get to taste food that I haven't enjoyed before, such as the Columbian treats found at Mekato. I sat outside with the puppy, so I didn't get to take a look at the assortment of goodies (if you go for breakfast/lunch, the restaurant to the north is closed and has nice benches to sit on). I will say, though, that RAB chose well. 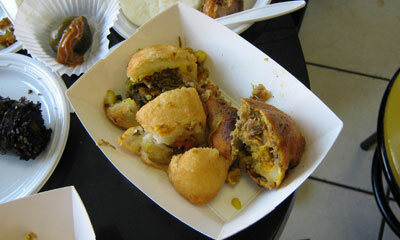 The beef empanada was definitely the highlight, following closely by what RAB called the "meaty potato ball." I also enjoyed the passion fruit drink (the raspberry drink was tasty, but not as good). Mekato was a great detour on our way to the Montrose Dog Beach. I can see visiting again soon for another delicious inexpensive lunch. Sunday morning with an LTH crew was perfect. As noted before, the bunuelos are little jewels - a cafe con leche and a freshly made bunuelo or two is a subtle delight that I will be sure to enjoy again soon. As the master of excess was handling ordering, we also worked our way through pretty much everything else in the savory case and a few of the sweets. REB has done an excellent job cataloging what we had, and I agree with most of the comments, so I will not revisit that. What was not mentioned were the wonderful chorizo we sampled. A very worthy nomination in my book. Josephine wrote: Guys, remember that the bunuelos don't come out until around 8:30 AM. 9:30 they were still staging bunuelos out of the back, hot, crisp, light, with the merest suggestion of cheese, ever so delicous. 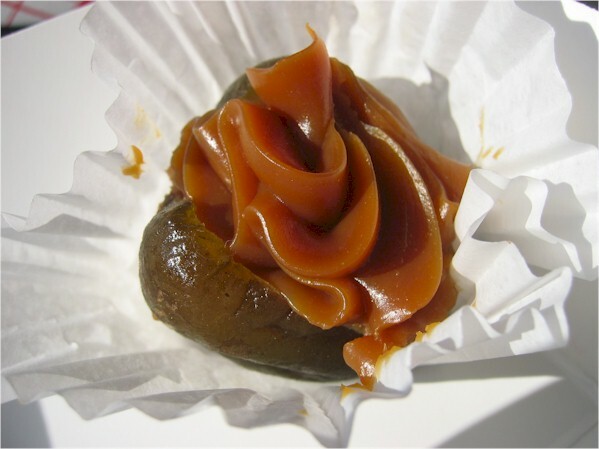 Lightly marinated green figs with cajeta a revelation, smooth sweet toasty caramel perfect foil for tart slightly unripe tang of fig. Alas, I did not get a good picture of the green figs with cajeta, though Cathy has a terrific one up thread and I'm guessing Kate, Terrasini's bride, got a few good ones. Even though I have been to Mekato's a number of times I thought Sunday was the best, on all counts, I've experienced, food, company, friendly interaction of customers and staff, even the always good cafe con leche tasted somehow better that morning. 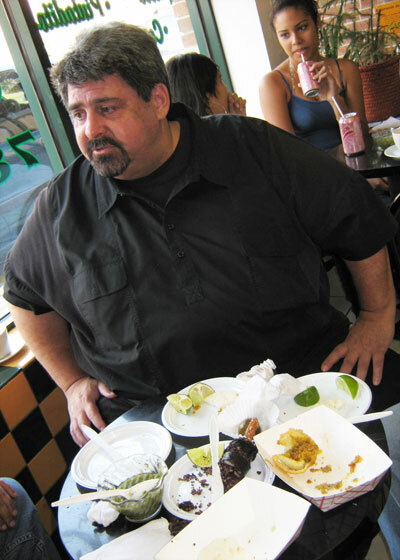 Other bites of note were crisp cornmeal crust empanadas, crunchy chicarron served with a wedge of lime, sweet arepas with cheese melted on top and plain served with chorizo and dense, deep flavored blood sausage, which Terrasini spotted tucked away in the back of the hot case. Good call for Sunday breakfast on Dickson's part, gave me a chance to visit Mekato's with LTHers and mightily shore up my support for Mekato's GNR nomination. Ah, I've been scooped by Eagle-eye Terrasini! I never have seen that blood sausage before. But that is what happens when you set a bunch of LTH-er's loose on a good place-they search out the most interesting tidbits. Maybe there should be a "miraculous- apparition-of-little-known specialty" criterion added to the GNR discussion process. stevez wrote: This place has all the makings of a GNR, but I'd sure like to see it get a little more LTH love during the nomination period. This place, like one or two other nominations this round, would really benefit from a bit more of a track record. It sure has gotten a little more nomination period love. Track record overall is still a bit thin, but the depth of enthusiasm, I find compelling. This nom reminds me a lot of a tavola, actually...places that have clearly, deeply captured the nominations of at least a few long-standing posters, places that most certainly seem to have a GNR ethos, but have, for whatever reason not attracted the long, multi-thread, multi-trial of 20-30 or more posters like some places (hot and new or old and foreign, usually). I'm inclined to think places like this (Mekato's, a tavola) are worthy GNRs. Mekato's is a fantastic place. Thanks for bringing this place to my attention. I absolutely loved the bunuelos everything we ordered but the figs with cajeta were out of this world. 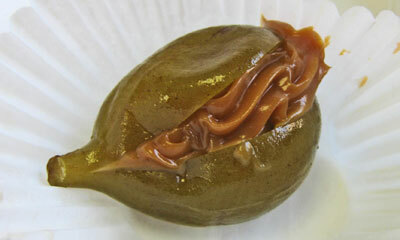 The fig had a slightly pickled flavor, which contrasted perfectly with the caramel filling. This place has the goods and should be a GNR. I think the last time I ate at Mekato's, I brought pastries to an LTH meeting about a year ago. I still can't get over the bunuelos fried in lard - I was just discussing how I don't really like fried sugar pastries - these are like the anti-doughnut, custom-made for my tastes, savory and pillowy. I also love the alfajores, and the pickled figs with creamy cajeta. Definitely worth stopping by for a cup of coffee and a pastry in this desert of Dunkin'; nothing has changed with this place since it was awarded the GNR...I doubt anything changed there since the place opened. Mhays wrote: nothing has changed with this place since it was awarded the GNR...I doubt anything changed there since the place opened. One little thing has changed, my appreciation for the pastries. Slightly dry and not as sweet as American style they took a while to grow on me, but I've added them to my Mekato's lineup along with chorizo, empanadas, bunuelos and chicarron. Oh, and Elephant Ears, I really like the elephant ears. 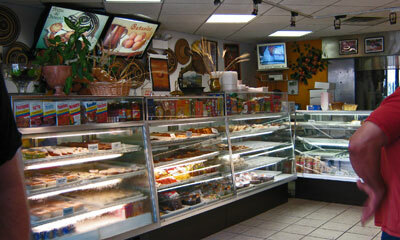 Mekato's Colombian Bakery, count me a fan! I stop by Mekato's whenever I can, probably every other month on average (not so convenient from Naperville, or it would be more often). Dark, rich coffee and fresh, hot, greasy and cheesy bunuelos are a treat. I prefer their savory offerings over the sweet, though I do sweet every once in a while. Had a Colombian friend visit from Canada a while back so I brought a sampling and I am not sure I have ever seen such unbridled delight. Apparently Colombian bakeries are not too common up there, either. The place is a gem, a window into a different cuisine, unapologetically true to its roots. That makes it a paragon of a GNR for me. Yes, for most of us it is a bit of a one note spot - fresh hot bunuelos being the stars, but the quality is high throughout, the service friendly, the offerings a bargain. Count me as a support for renewal. I stopped in last night shortly before they close at 9:00. I hadn't been in a couple of years, but it seemed appropriate after a Latin dance class! They were empty when we got there and very friendly in pointing out their more popular items. My recollection is that when busy, getting service is a bit chaotic. 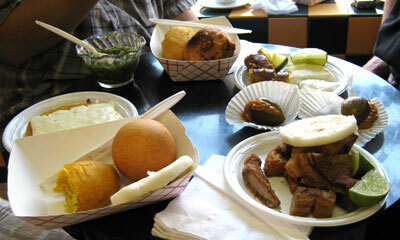 We tried three items, an alfajore, a cheesy flavored bun and a guave and cajeta filled pastry. All the items were quite good. I'd also note that they have their GNR certificate prominently displayed twice. I think Mekato is worthy of renewal. I neglected to post on my last visit. Happily, it was Columbian Independence Day, and they had planned for a big influx of customers. The bunuelos were just-fried, as they always are, but the croissants with cheese and the churros were fresher than usual- also just baked or fried. Such a friendly crowd there. Love the place! Whenever I visit from STL , I am there without fail. That does not make a GNR, but I'm glad to see others enjoy it!